Get your voice in shape the Funky ‘n Fun way! Want to enjoy and look forward to warming up and working out your voice? Fancy getting down and getting ‘in the groove’ whilst developing your vocal technique and your ear? 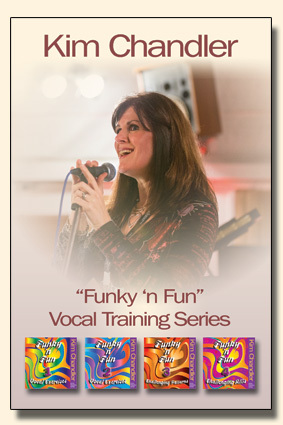 Then top vocal coach Kim Chandler’s “Funky ‘n Fun” vocal exercises are for you! For beginners through to the seasoned pro vocalist, with this stratified program from the ‘easiest’ CD 1 through to the most challenging CD 4, you choose your level and away you go! Kim’s extensive experience and abilities as a singing teacher and performer form the basis of this innovative vocal training series. These effective and fun exercises are designed to help you work on warming up and strengthening your voice, developing breath control and endurance, stretching your range and vocal agility, improving your tone quality, tuning, ear-to-voice co-ordination, articulation and creativity, and they’re all backed by funky backing tracks which appeal to the modern vocalist. This popular vocal exercise series is Vocal Technique, Ear Training and Musicianship for the Contemporary Singer all rolled into one funky package! Why not join with the many satisfied customers across the globe and reap the benefits of this unique vocal product. QUALIFICATIONS: Kim has a Masters degree (with Distinction) in performance, a music education Bachelors degree, and maintains on-going professional training in reputable vocal techniques, methodologies, vocal anatomy & physiology and voice research. TEACHING EXPERIENCE: Kim has spent many years teaching pop vocal technique to literally thousands of students up to masters degree level in the academic world and to celebrity level in the commercial world. She has 14 years of experience as a degree lecturer in contemporary singing. ACADEMIC ‘CRED’: Kim is a sought-after presenter at national and international voice conferences, vocal master classes, workshops and training days, and is a two-term director and past President of the prestigious voice science organisation, the British Voice Association. INDUSTRY ‘CRED’: Kim has many years of high-end professional performance experience in the recording studio, TV and live environments, including performing with many national and international artists. She also has regular TV, radio and press media exposure as a vocal coach. Many tertiary institutions and leading vocal coaches throughout the world use and recommend “Funky ‘n Fun”!